Think about all the things that make your home comfortable and you’ll realize that all your choices reflect a style that is yours alone. At York, we think that spirit can extend to your air conditioner. That’s why our York Affinity Series Air Conditioners were designed from the ground up for both comfort and aesthetics. You’ll find reduced noise, efficient performance, and long-lasting value that fit your style. Superior efficiency is one of the results of using environmentally friendly R-410A refrigerant. Impressive durability comes from automotive-quality powder-coated paint, plus sealed electrical contactors and rigid base pan. Feel reassured with an outstanding limited parts warranty, plus impressive compressor warranty coverage. Two-stage compressor takes quiet and efficient operation to another level. 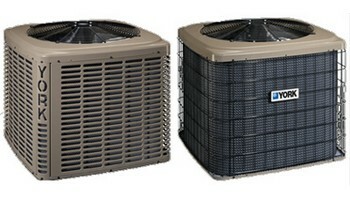 Affinity air conditioners can provide double the efficiency of older models. To use the map and chart, determine the SEER of your current system. Then using the map, find your zone. Cross-reference your zone and SEER in the table to determine your approximate operating cost. Take the difference between your current cost and that of a new, more efficient Affinity™ System to learn your estimated annual savings. Affinity Series products are available with environmentally friendly R-410A refrigerant. This “new generation” refrigerant releases heat more efficiently while being safer for the ozone layer.They take pride in knowing YORK home comfort systems are keeping our friends and neighbors comfortable in homes across the country. And because YORK air conditioners are designed and built in North America by Johnson Controls – a leader in world-class manufacturing – you can be confident a YORK air conditioning system will provide your family with comfort, energy savings and lasting performance for years to come.We design and build YORK products here in North America, where they can closely monitor and improve processes that directly affect quality. It’s this commitment to excellence that allows us to offer outstanding warranties, meet the highest industry standards, and deliver energy saving comfort that lasts a lifetime. That’s why, when it comes to home comfort, your confidence is our commitment. More than 215,000 hours of research, five years of accelerated field trials and extreme weather testing ensure reliable performance that lasts.State-of-the-art quality control and assembly processes built upon the manufacturing expertise of Johnson Controls.Matched components do more with less, which is why YORK products fit perfectly in your home while delivering advanced levels of efficiency.Quiet, small-footprint cabinets deliver big performance with features that meet your needs and fit your budget. They use R-410A refrigerant, which doesn’t harm the ozone and keeps your system safe and efficient. They design and build YORK products here in North America, where we can closely monitor and improve processes that directly affect quality. It’s this commitment to excellence that allows us to offer outstanding warranties, meet the highest industry standards, and deliver energy saving comfort that lasts a lifetime. That’s why, when it comes to home comfort, your confidence is our commitment.